Whitehall H-90-S Stationary Whirlpool is recommended for shallow or deep body immersion offering complete coverage of extremities as well as the entire back and shoulder area with greater patient comfort. Tank Capacity is 90 gallons. 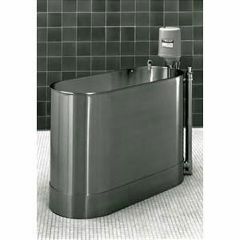 Whirlpool Tank is 48”L x 20”W x 28”D and is seamless welded construction, fabricated from heavy gauge, type 304 stainless steel, polished to a satin finish. Tank rim is reinforced with a concealed stainless steel rod. Tank is fitted with an auxiliary drain valve. Tank bottom is seamless, rounded coved design to minimize bacteria buildup. Tank is also provided with an extended stainless steel skirt flush to the floor line to conceal internal drain piping. A 2” Combination Drain and Overflow, and a Filler Spout are provided. (See roughing-in dimensions on the drawing). Turbine Raising and Lowering Devicepermits adjustment of desired height and direction of water agitation towards the area of the body to be treated. It is spring balanced and provided with a locking device. Turbine Assemblyfunctions both as agitator and emptying device. It is equipped with Underwriters Laboratory listed 1/2 HP jet pump motor protected with an ABS plastic shell, and automatic thermal overload protector, and lifetime-sealed bearings. All parts contacting the water are stainless steel, chrome plated brass or bronze.